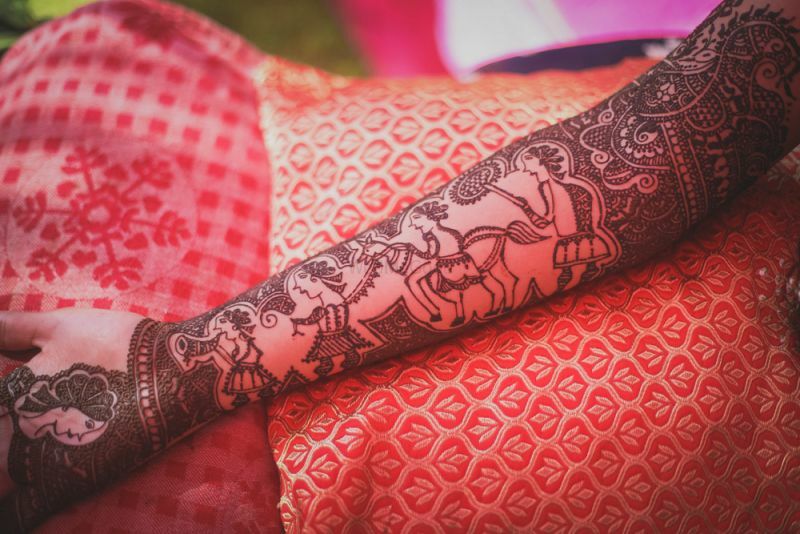 For brides who like elaborate and intricate work, there is nothing quite like a full blown baraat mehndi design showcased on your arm. From beautiful palki motifs to bride and groom garlands and even the baraat procession, this one is fit for a queen . Also costs the most expensive and is the most time consuming design to make. 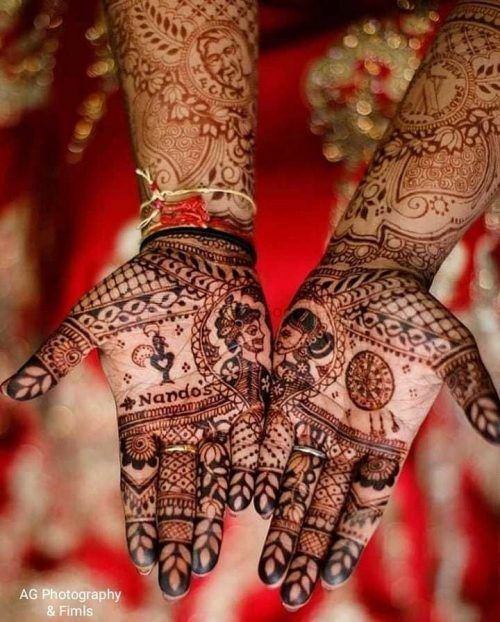 We love how magnificent this mehndi design looks! This design requires a lot of detailing so make sure your artist is briefed about it well in advance. 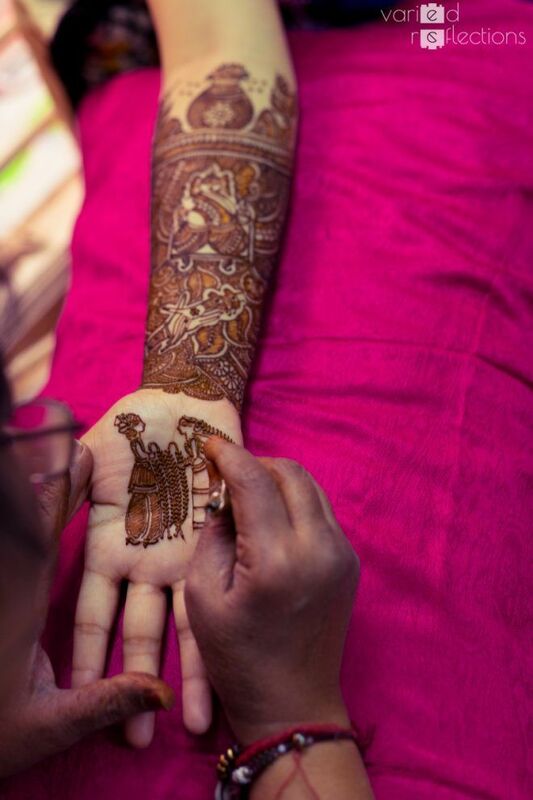 Bride & groom figurines got a makeover, as the mehandi designs featuring a couple is no more just about them facing each other! 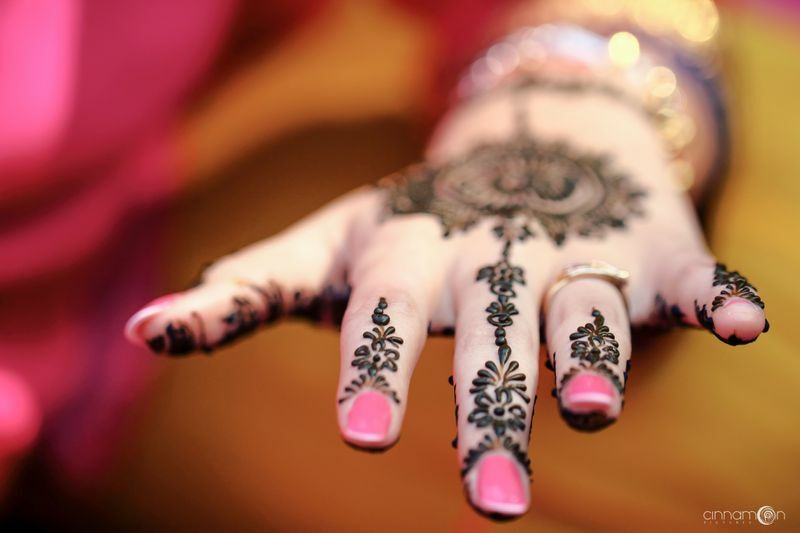 Extra attention is paid to details like the bride's hairstyle, lehenga or the groom's safa, sherwani and more! Instead of just getting the baraat sequence drawn, brides these days are going extra and opting for the entire wedding sequence for their mehndi design. 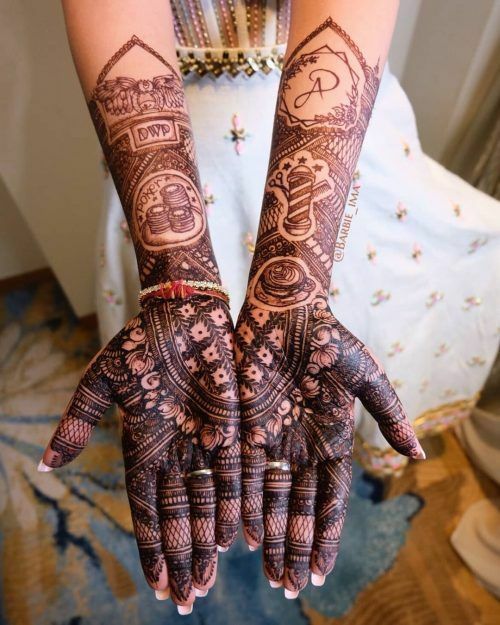 Right from baraat to jai mala, to mandap rituals and finally the vidaai is being depicted in this design. 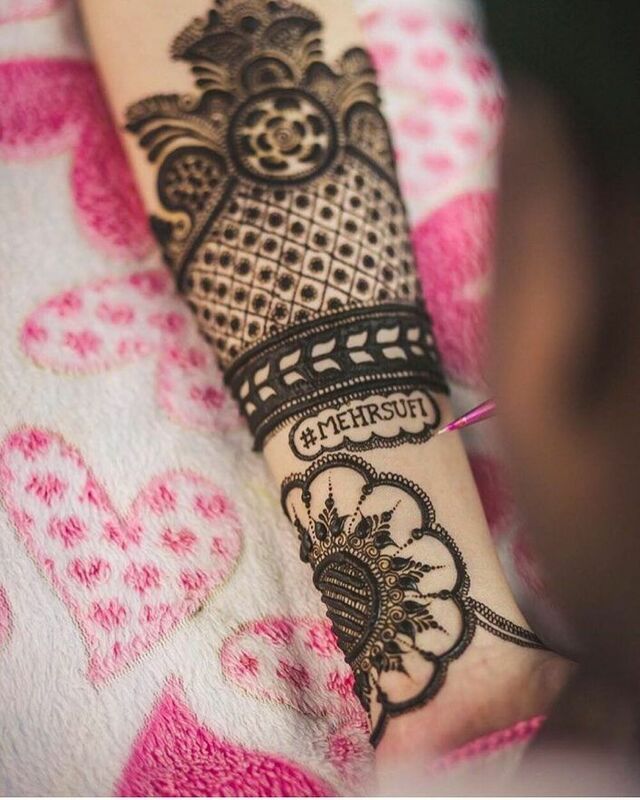 To get this mehndi design done, you'll need to hire someone with exceptional skills! Making caricatures/ sketch by looking at the picture is not at all easy and you wouldn't want someone to ruin your big day with average work. 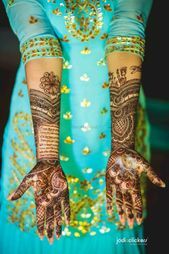 The following designs are personalised mehendi designs where brides add something thats personal to them on their mehendi. Right from portraits of a puppy the couple loves, to quotes that are special to them to even their caricatures. With Your Own Wedding Hashtag! 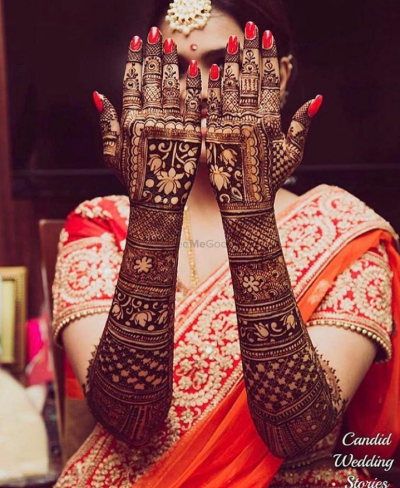 Brides are adding their love stories on lehengas, invites and even on mehndi these days! It can have a gist of where you both met, where and how he popped those three magical words and make everyone around sob with joy. Yayy! This one's for all the 'minion' fans. Instead of regular figurines, you can get minion theme figurines made. So much fun & cuteness! 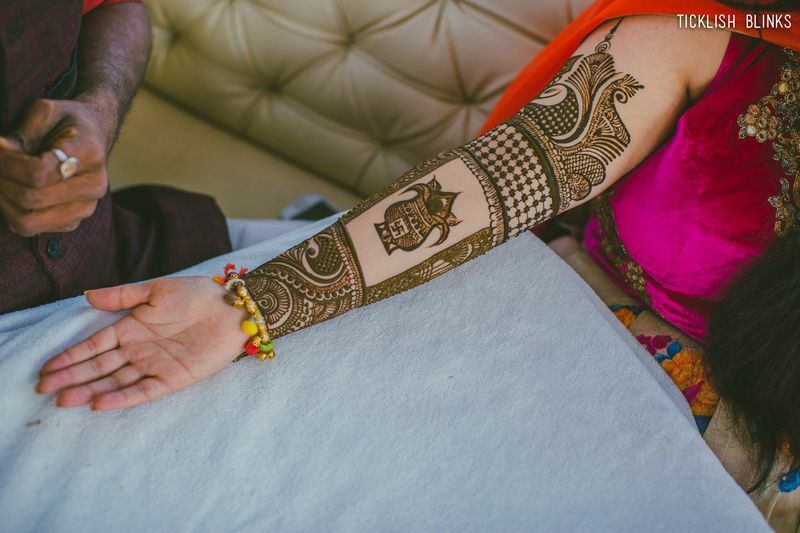 Modern brides are going a step ahead with their mehndi designs by getting vows added to it. It's not just quite unique but also really adorable, as a form of expression. 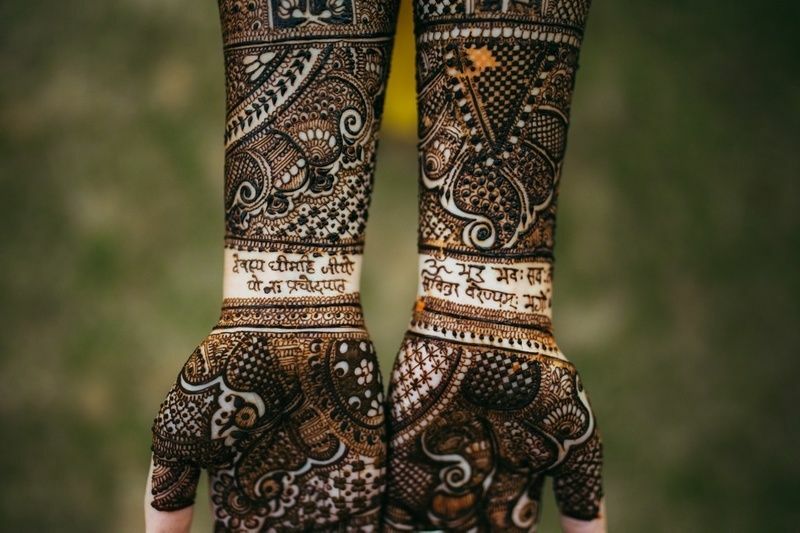 Like this one says "I won't give up on you, so don't give up on me"
Instead of keeping it traditional, how about adding elements that you both love in your mehndi design? Be it your favourite restaurant or a common hobby! Endearing, to say the least! 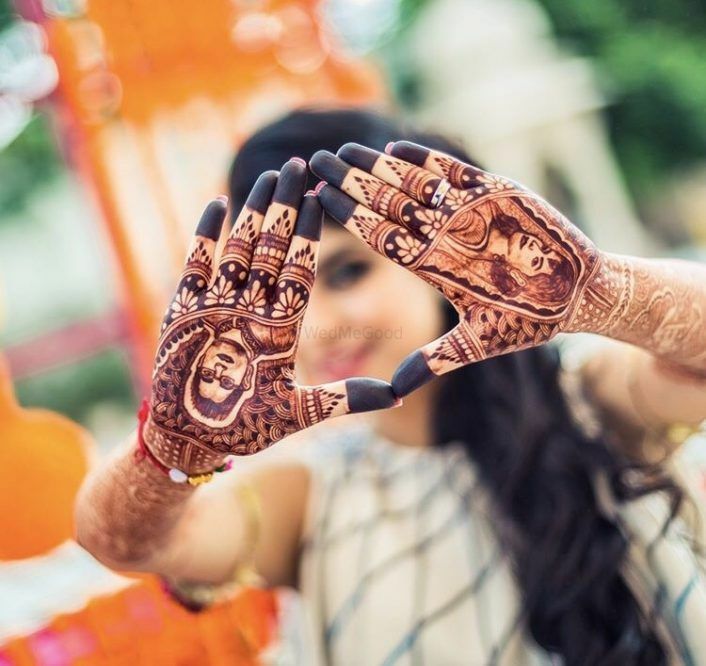 With this mehndi design, the brides get to tell a story by joining their hands! 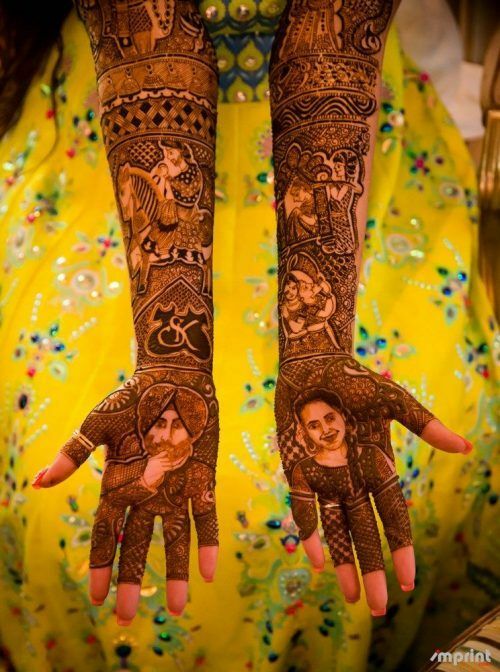 The most popular one in this category is groom on one hand and the bride on the other!! 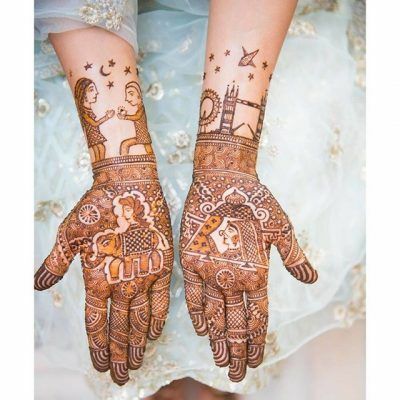 Refresh your old school mehndi designs by adding geometric elements to it. Because no woman wants it to be mainstream when it comes to her own wedding!! 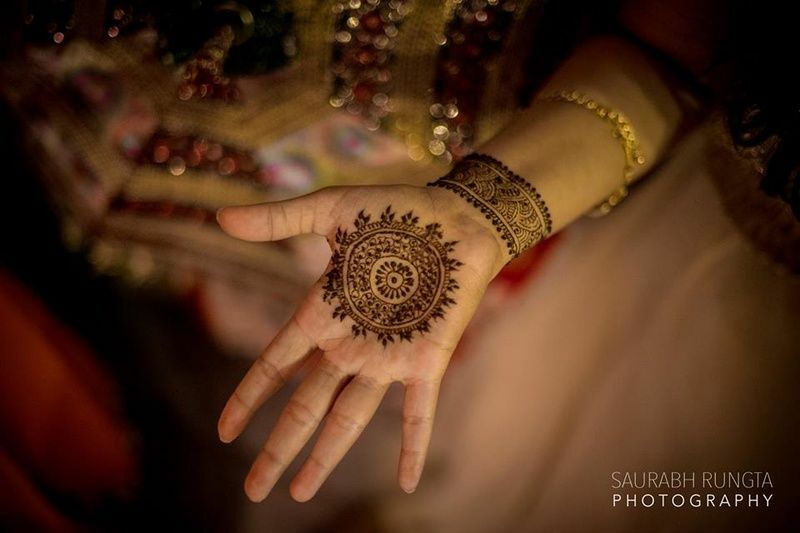 This mehndi design is back in trend and how! The mesh-like design now comes with a modern twist wherein other details are being incorporated within the jaali. 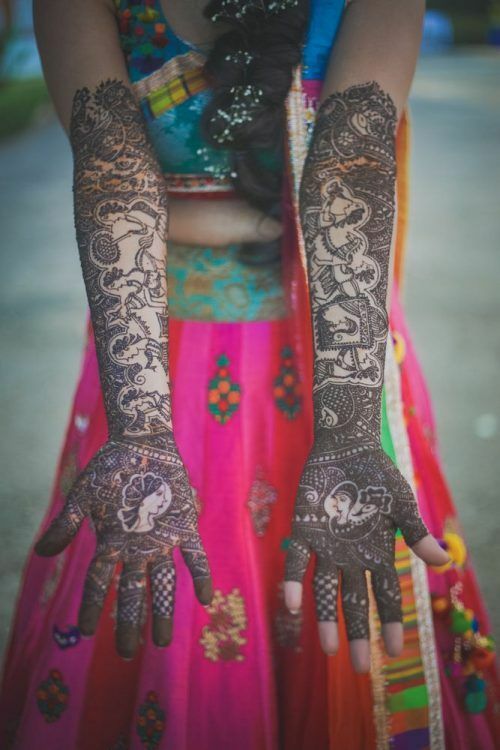 Put A Little Fun With Parrots In Your Mehndi! 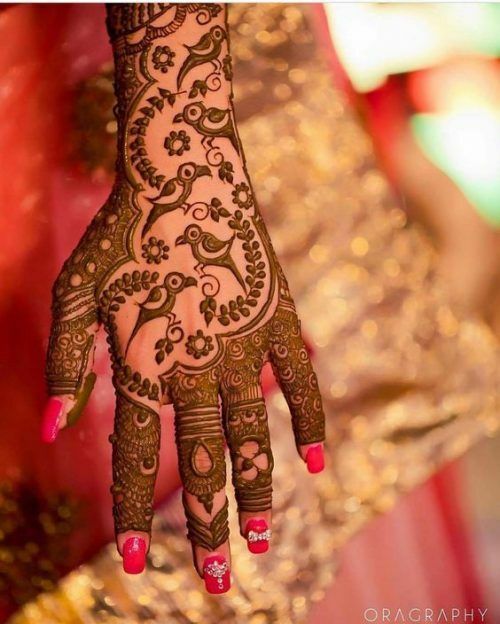 Adding parrots to your mehndi design can be aesthetically appealing! 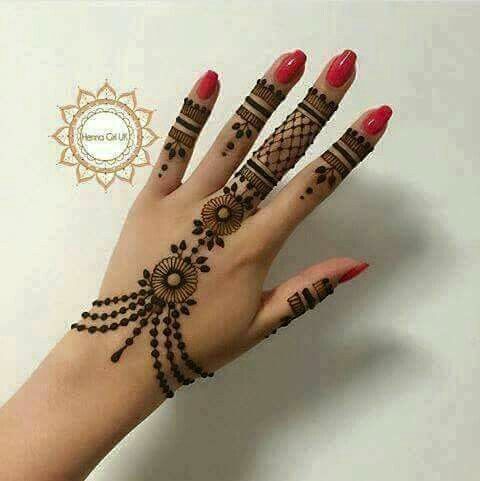 It gives an Arabic mehndi like vibe to the design. You should definitely give this a try! 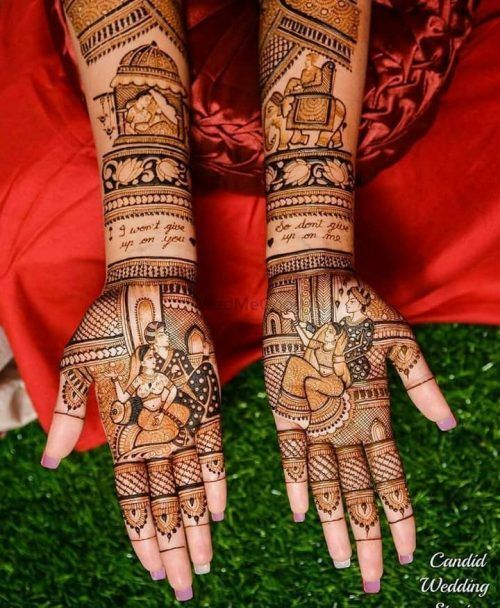 This mehndi design is for those brides who love everything maximal. 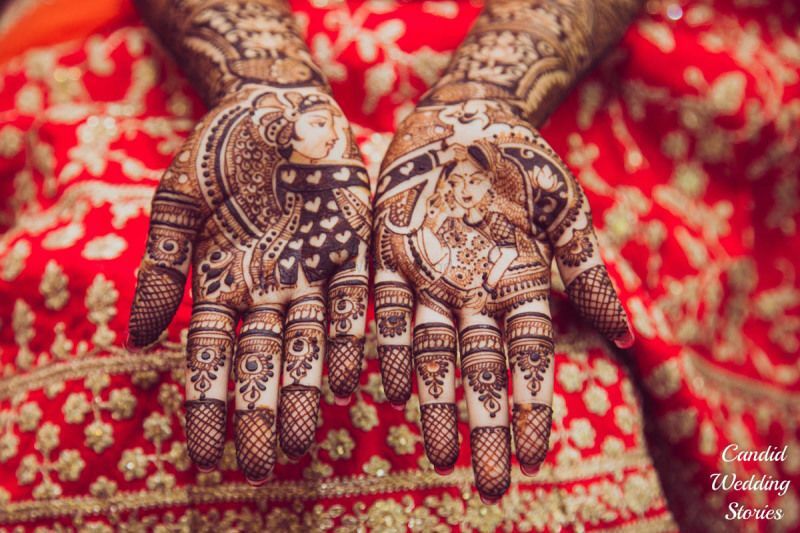 Heavily detailed yet so intricate, it'll look absolutely beautiful on the wedding day. This one is all about giving importance to your beliefs! 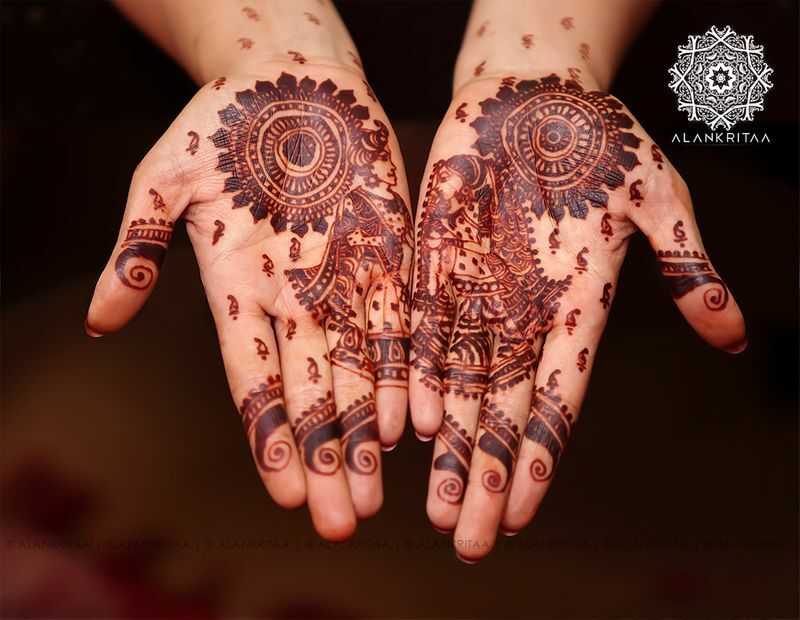 You can go spiritual with your mehndi design and get patterns of God or religious symbols created. 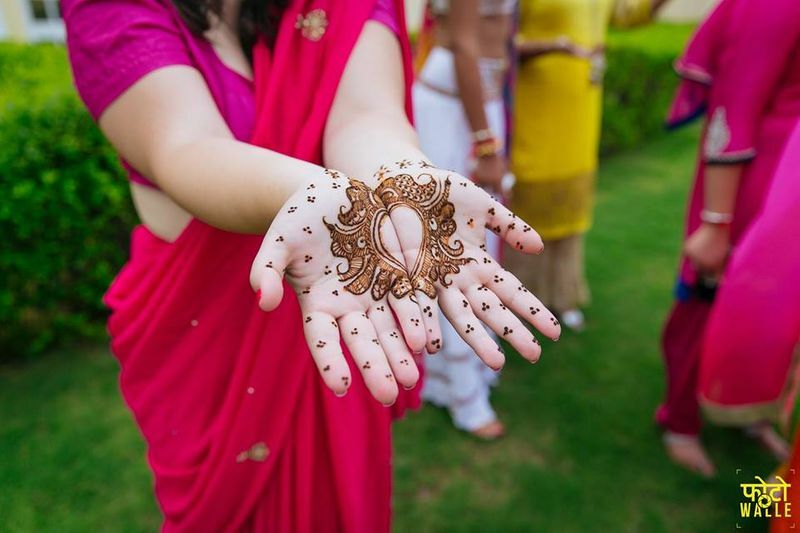 Jai mala moment is one of the most exciting parts of a wedding! 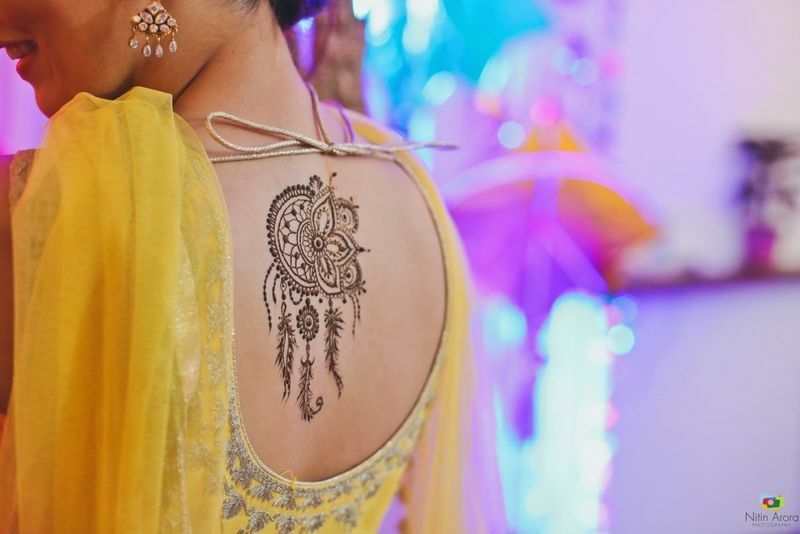 This is an attractive design for those who want to flaunt a mehndi design that would stand apart from the crowd while being a cherished memory. Sitting on a chair stuck for 5 hours trying to make elaborate patterns is not everyones cup of tea. 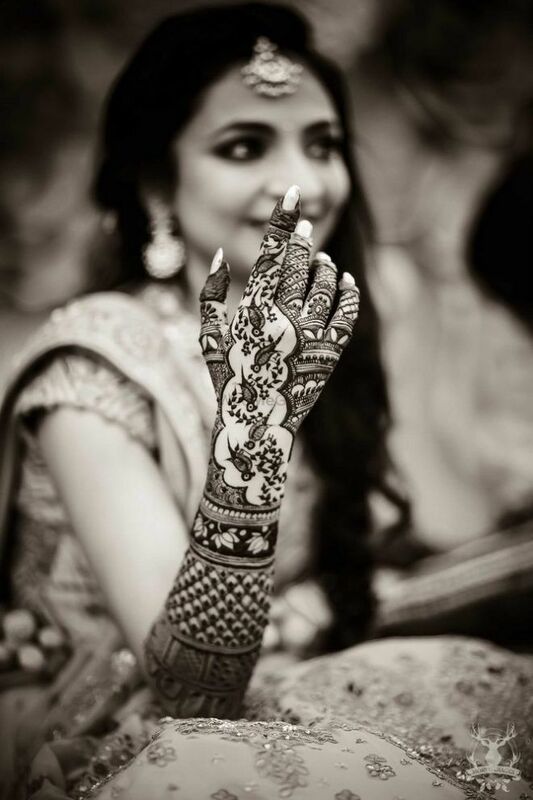 Plus, some brides are just not big fans of the mehendi sheband and they prefer something simple, minimal and less OTT. These chic and minimalist designs will set you back half hour ta the max but still look beautiful. 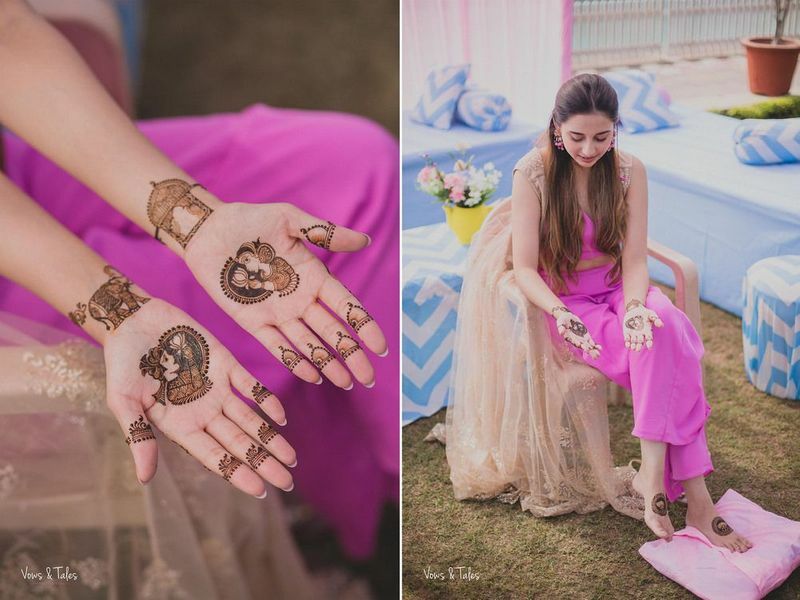 Minimal mehndi is one popular trend these days! 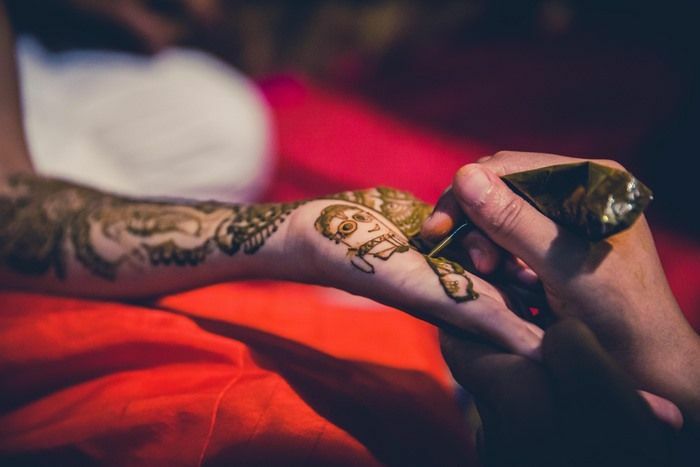 If yours is a minimal wedding wherein everything from your lehenga to decor is light and subtle then you'll need your mehndi to be in sync too. Also, there's no limit to experimentation here!! 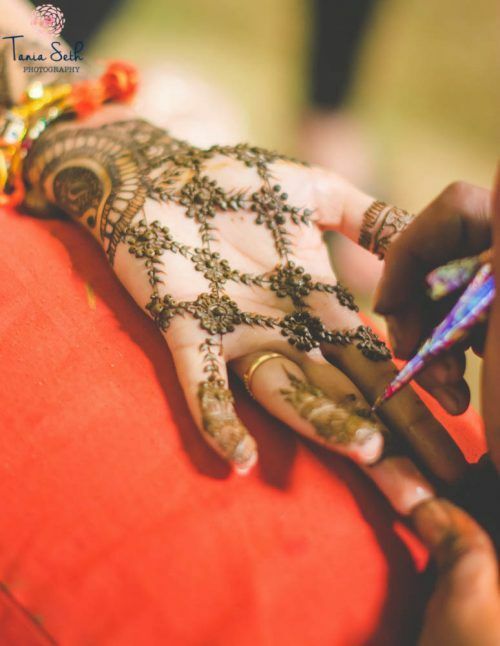 Give your real jewellery a ditch by getting a jewellery mehndi design drawn! Go for patterns that are trendy and nail any look with an ease. 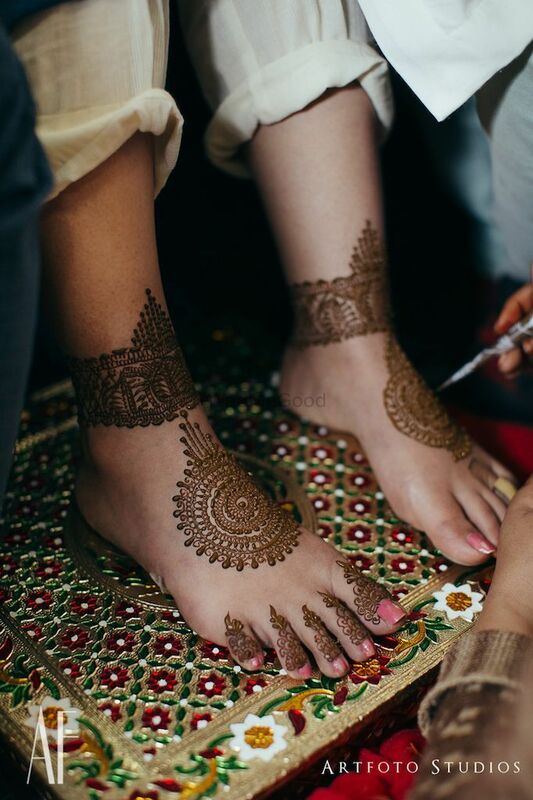 This one is for the brides-to-be who don't like mehndi but can't do without applying it because umm.. you've got to wear mehndi at your own wedding! 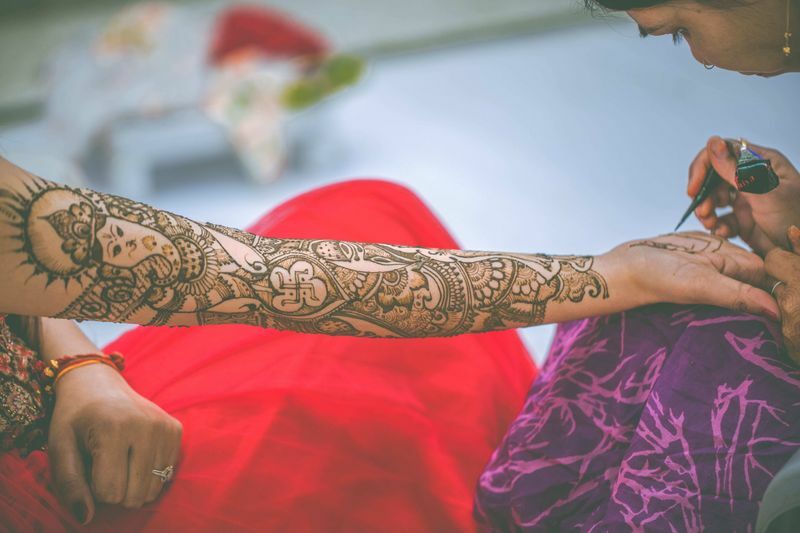 If you're spiritual that way, then how opting to get Gayatri Mantra drawn in your mehndi design! Nice way to pay regards to your belief. Remember when gladiator footwear was so much in rage? 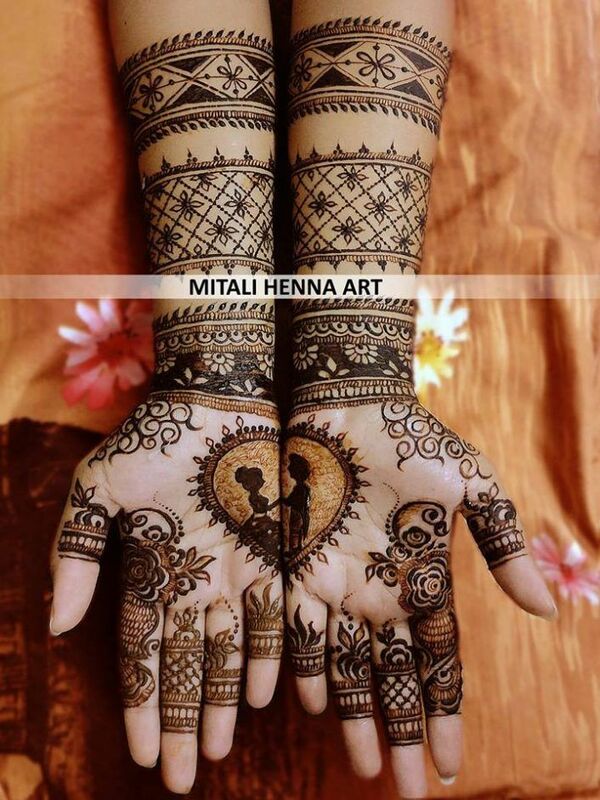 Though that trend is out now, we have a substitute of the same in form of a mehndi design! Would you dare to experiment? 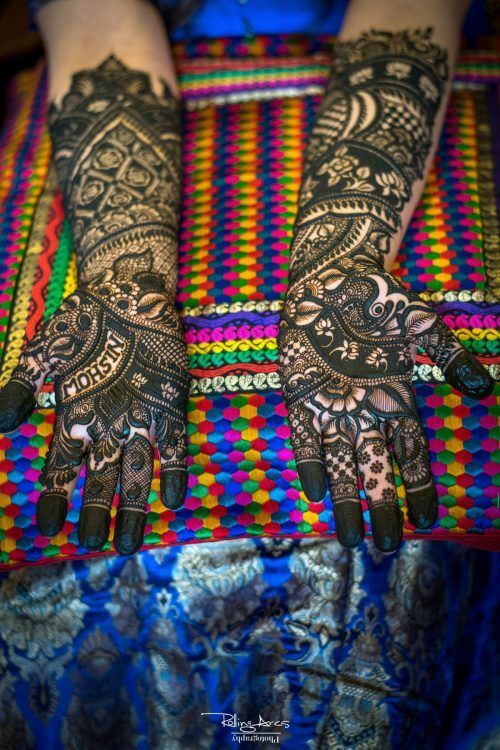 Not a fan of traditional mehndi design? Go for one with spaces as it'll act as a breather and won't overpower the other design. Simple yet stunning! 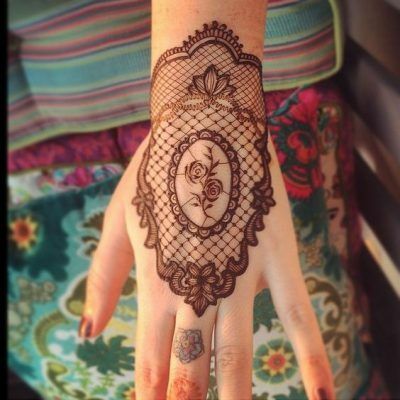 Who doesn't love lotus motifs! 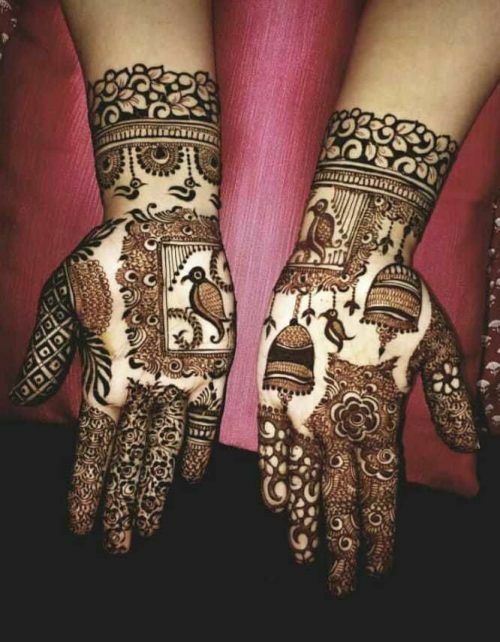 And you love them, even more, when they look as beautiful as these ones in your mehndi design. 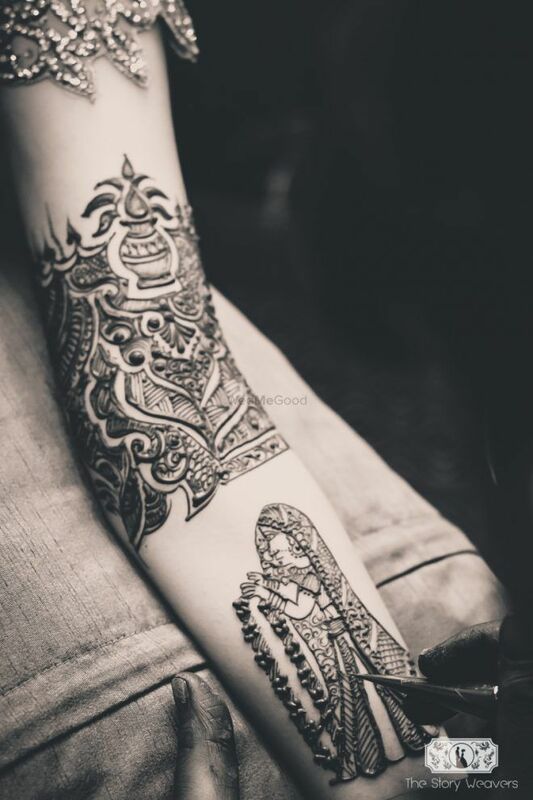 This mehndi design screams mordernity and freshness! 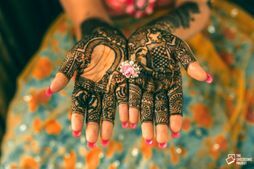 Since takes less time to be created, you can easily enjoy your mehndi ceremony instead of looking at the guests from the stage. 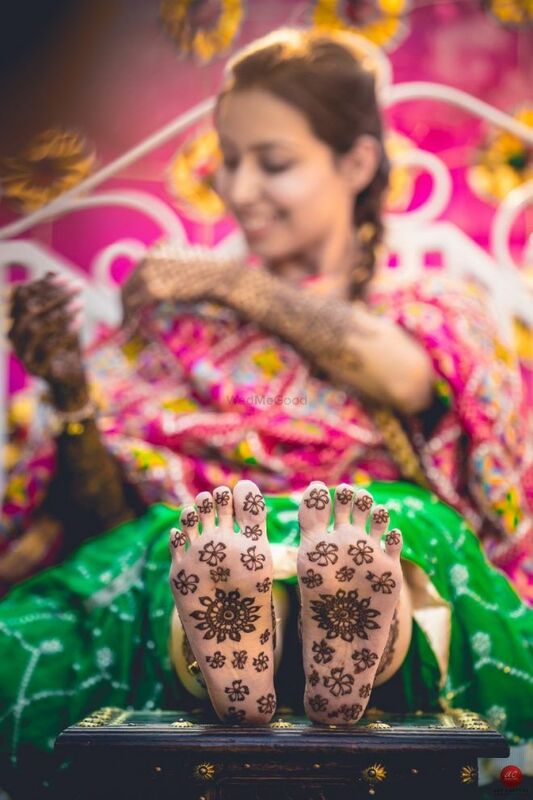 Mehndi on feet is not really visible, thanks to your grand outfits. 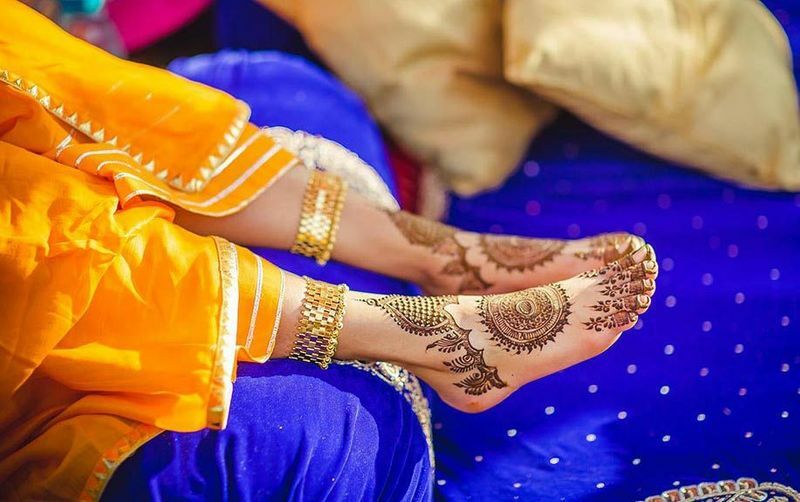 Then how about skipping heavy designs on your feet and opting for light ones instead! 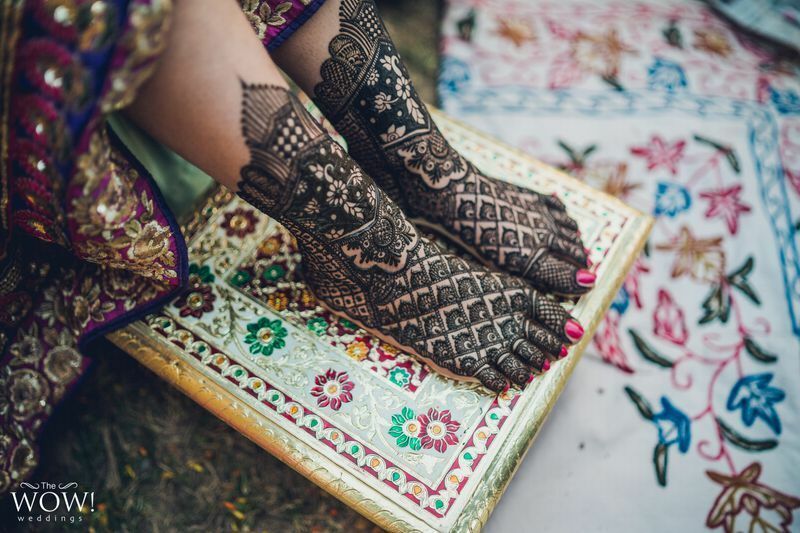 For brides who want a modern take on this tradition, combining french and english elements can create an almost glove like henna design that looks beautiful . Don't like it on your hand? Get It On Your Back! 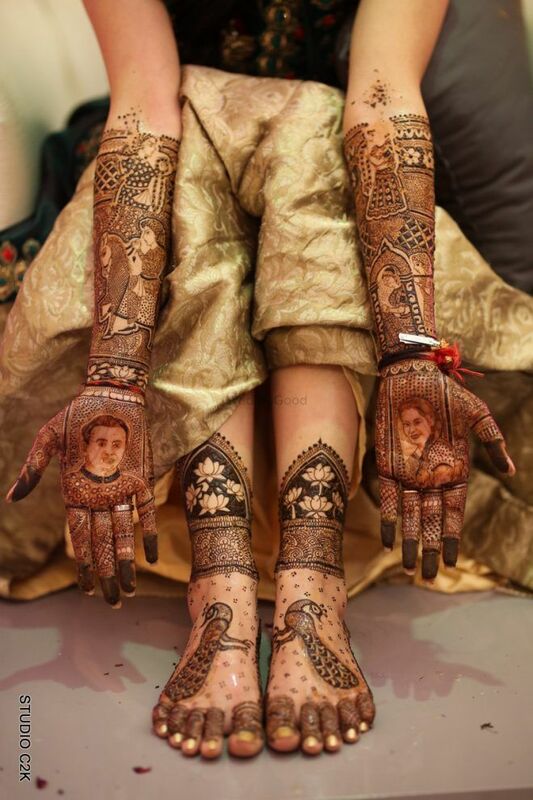 Mehndi of hands and feet are a passe? Go a step ahead and get on created on your back! Sassy, isn't it? Vintage Rose Design. How Pretty Is This? Isn't this one detailed, quirky pattern? 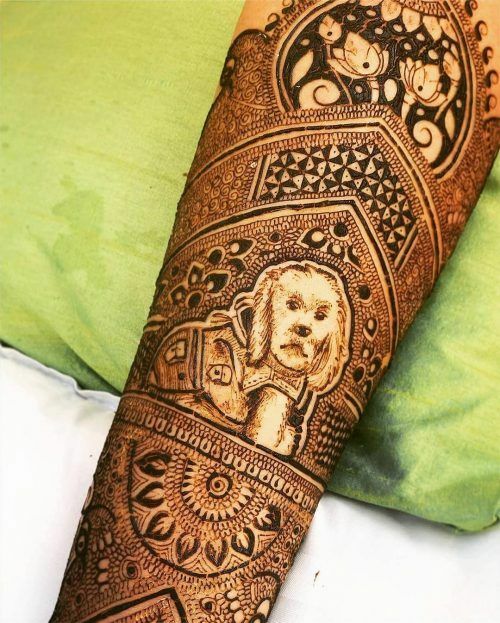 The craze for this mehndi design is on another level these days. Try this and make heads turn in a jiff! A new entry on the list, and is definitely here to stay! Very modern and looks elegant on brides-to-be. 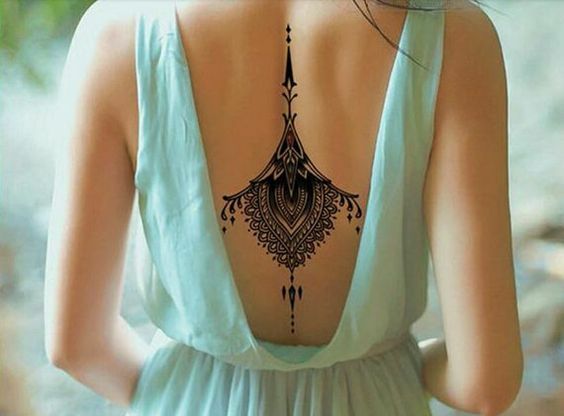 How About This Pretty Mandala Motif? Mandalas are amazingly pretty and one cannot deny that! 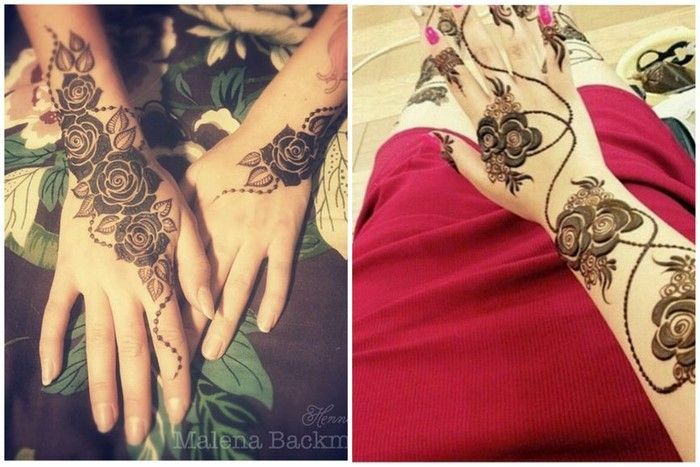 Getting them drawn on your mehndi would definitely be an unconventional choice. 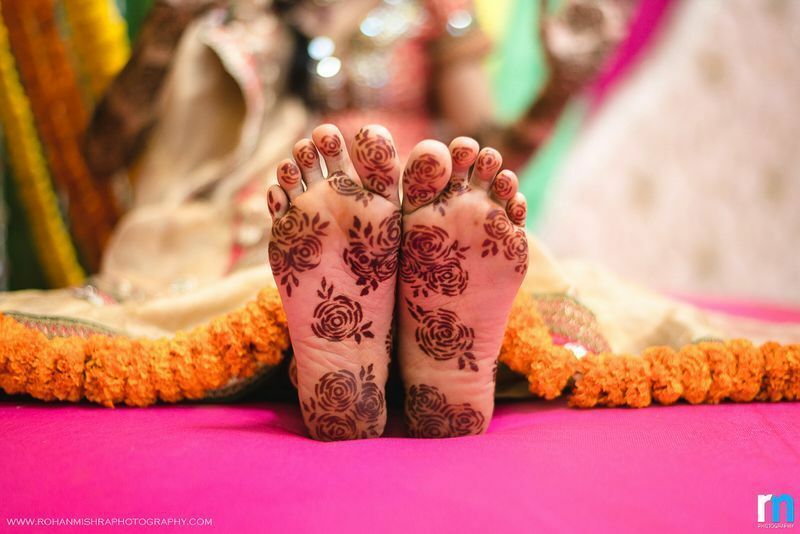 Love Simple Foot Mehendi? Get It Only On The Toes! This is one of the ways to highlight your freshly done nails and create a statement! Get Your Proposal Etched On Your Hands! 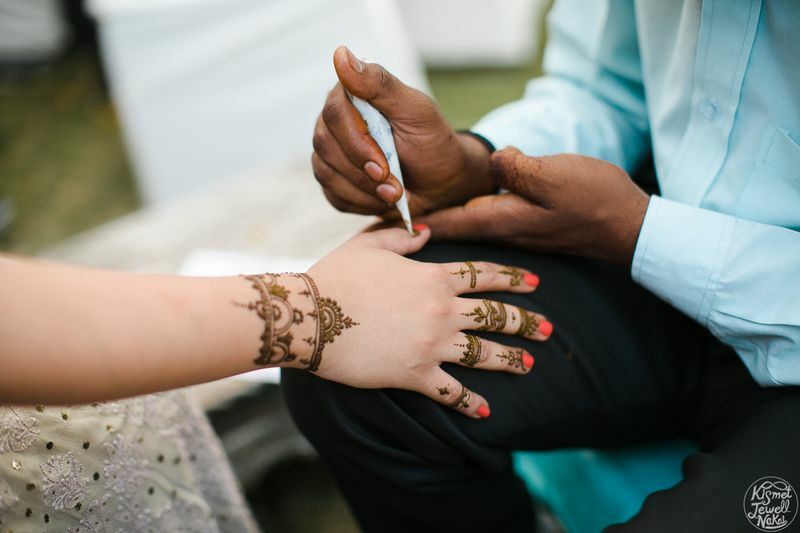 How memorable would it be to get your most cherished moment - proposal, drawn on your hands! 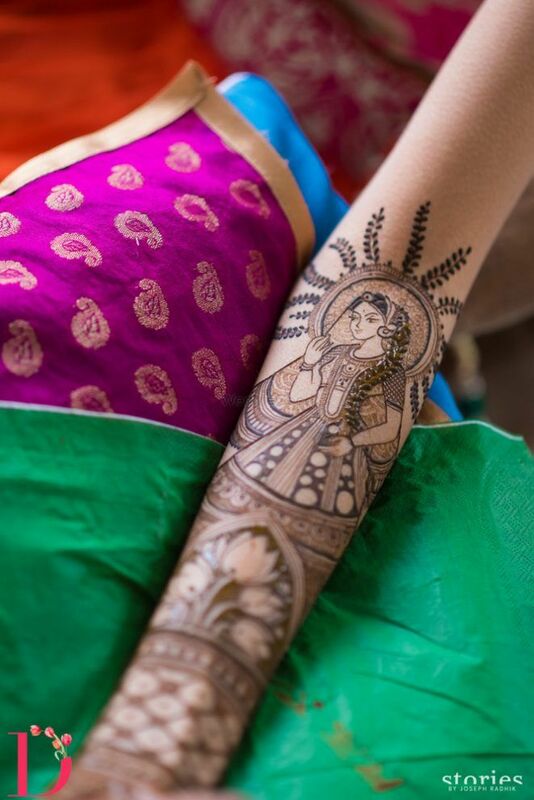 You can beautify the same with a plethora of motifs around. An aww moment indeed! 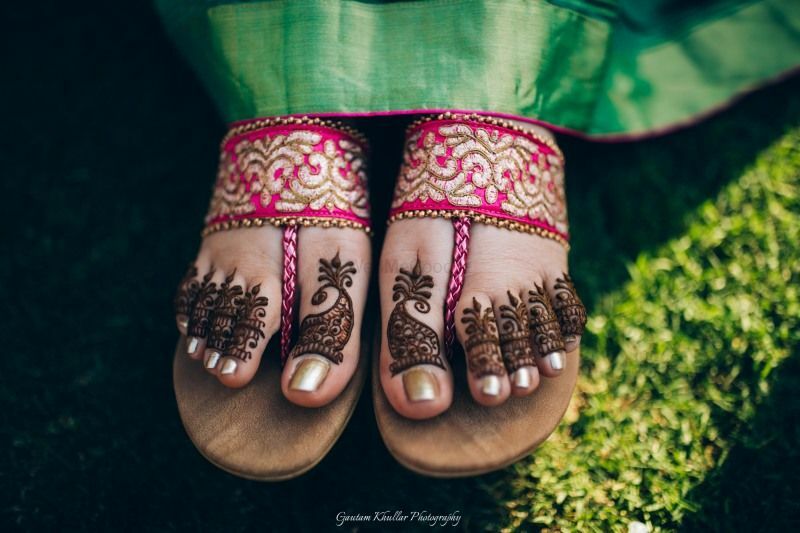 If minimal mehendi is something that you like, dont forget to check out 20 minimalistic mehendi designs for your feet. Pheww! 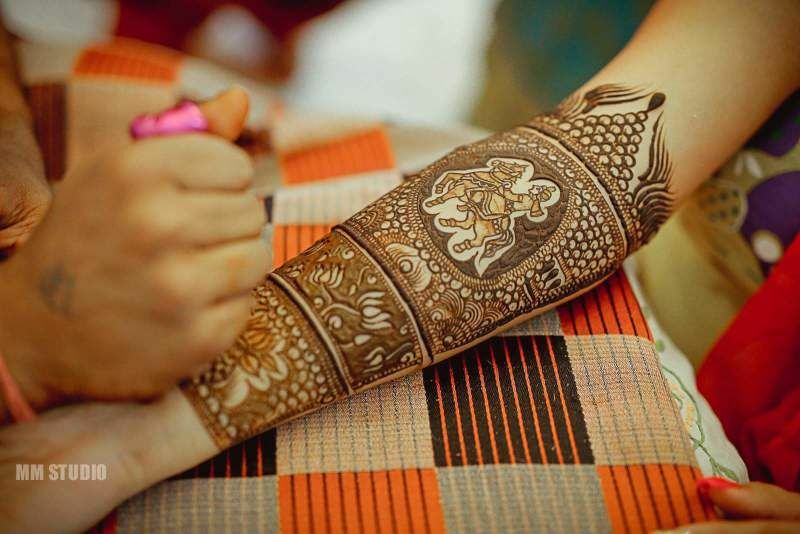 With this, we come to an end of the list of latest mehndi designs. 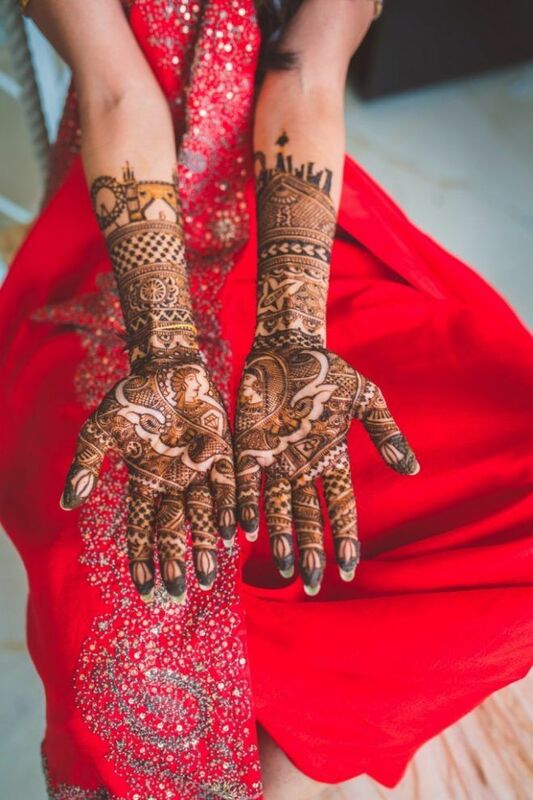 We're sure that you must have shortlisted your favorite by now, so go ahead, and jazz up your mehndi design with what suits your style and personality! 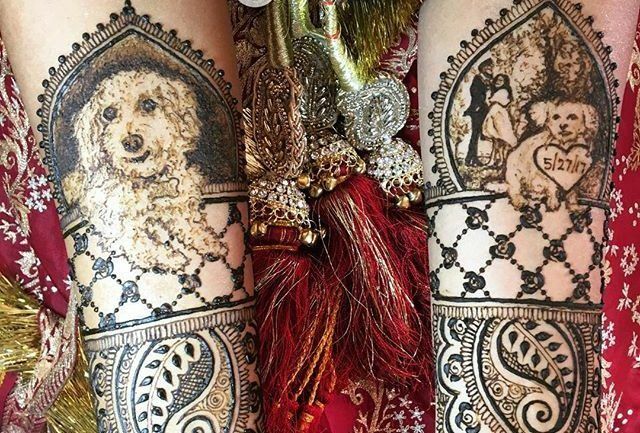 The Most Interesting Mehendi Designs From Real Weddings In 2016! 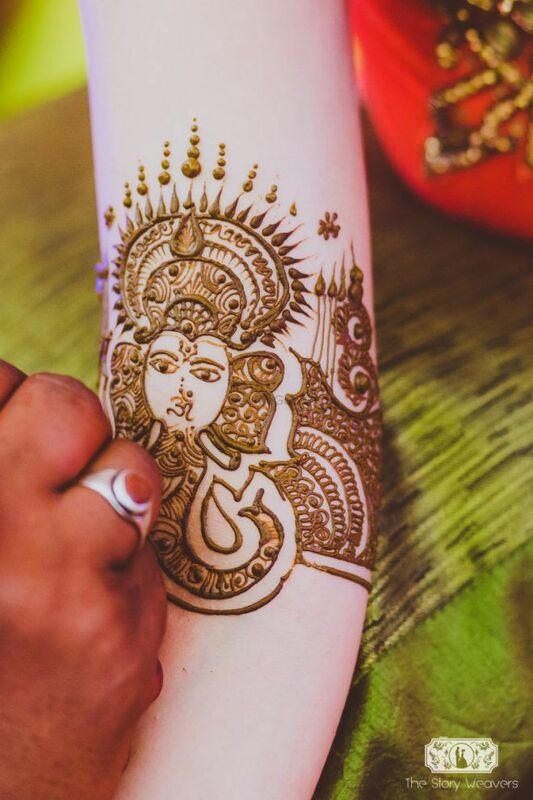 From Minimal To Intricate Ideas: The Most Popular Mehendi Designs for Every Type of Bride!